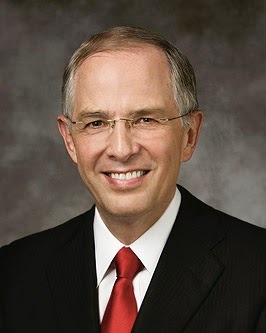 Elder Neil L. Andersen (1951- ) served as a Seventy beginning in 1993, and was called to the Quorum of Twelve Apostles in 2009 (the most recent member called). "'Fear not: for they that be with us are more than they that be with them. 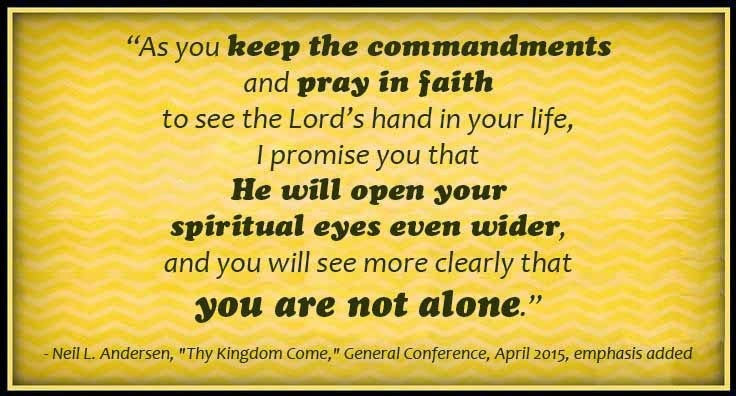 "As you keep the commandments and pray in faith to see the Lord's hand in your life, I promise you that He will open your spiritual eyes even wider, and you will see more clearly that you are not alone." Elder Andersen's assertion is that seeing and recognizing God's hand in the lives of others, or in the events of the Restoration and other world situations, leads us to see and recognize His hand in our own lives. I believe that is true! One of the blessings and privileges of serving in the Church is that you are often exposed to that kind of divine intervention. I have often been blessed as I've seen the hand of God at work around me. The brief story about Elijah and the "young man" is one if my favorites from the Old Testament. I have enjoyed pondering the imagery of the prophet mentoring the youth in word; but then praying for him that he might see and understand. The teacher knew he had a responsibility greater than just "preaching" — he wanted to make sure the message was received and understood, and so he devoted spiritual efforts in addition to his physical ones. God then was the one who intervened, and opened the eyes of the boy.